We did say when we set up this blog that we would only review restaurants that were not part of a chain … but we make the rules so we can break them. Also, the opening of Wahaca Brixton marks a further shift in what Brixton has to offer and does deserve some comment. It has taken over a large pub that used to be the Railway Hotel but was also part of the Brady’s chain of pubs and known as such by many locals. It was home to gigs, caucus meetings and other more shady goings on. There are some that still mourn its going but not so much by us. The beer wasn’t anything special; the carpet on the floor stuck to your feet if you rested for even a few minutes; and with the smoking you could cut the atmosphere with a knife. 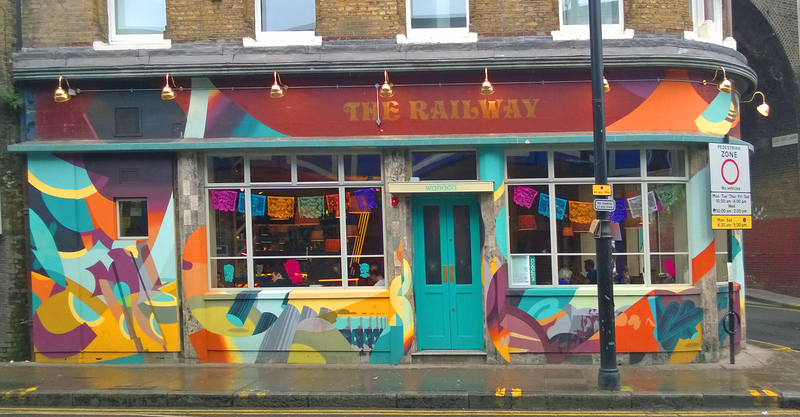 We spent many nostalgic and definitely misspent evenings there but, while there are different views about its loss in the eatinbrixton team, we do think that the new restaurant is an asset for Brixton. We are told that the décor is the same as in its other restaurants but we compared it with the décor on their website and it looks like Brixton does have its own character. Mixed colours and types of chairs and tables echo Brixton Village. Walls are stripped back to the brick in some areas but in others covered with plaster and the Wahaca style of brightly coloured murals. The website suggests a local influence too in the décor and furniture which is “eclectic” (they don’t match at any one table). When we visited early on a Sunday evening it was heaving but, despite their no booking policy, we easily found a table for three. There is a Tardis like quality to this restaurant with a pretty small front part seen from the street opening up to a high arch carrying the railway above. This is Mexican style food delivered efficiently by reasonably trained staff who need to keep the tables turning over. 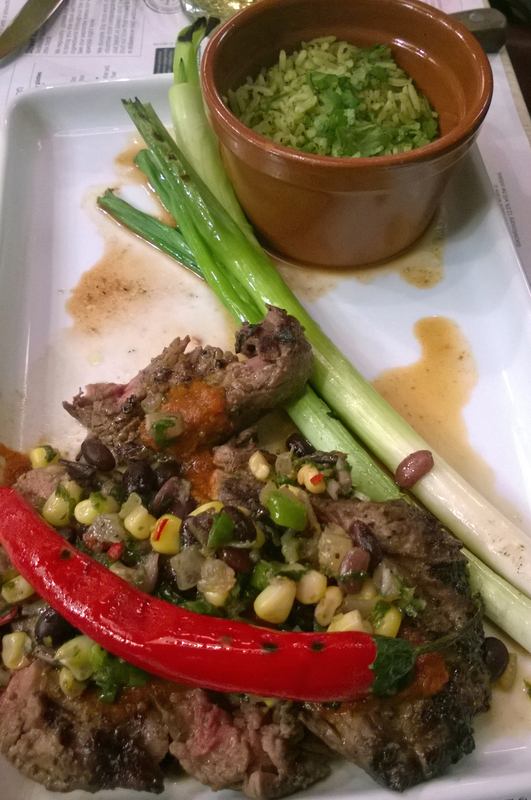 There are five parts to the menu – nibbles, street food, platos Fuertes (bigger plates), sides and puddings. The street food provides small tapas style servings, so you need two or three per head depending on how hungry you are. Platos Fuertes are the largest and you probably just need a side with these. Street food is what they are known for and they do have a wide range of tacos, tostados (tacos with cold salads), taquitos (tacos deep fried and served with crema) and quesadillas (toasted tortilla with melted cheese and another filling). All the fillings are interesting and even though they add new items each day it would take a while to work through them all. 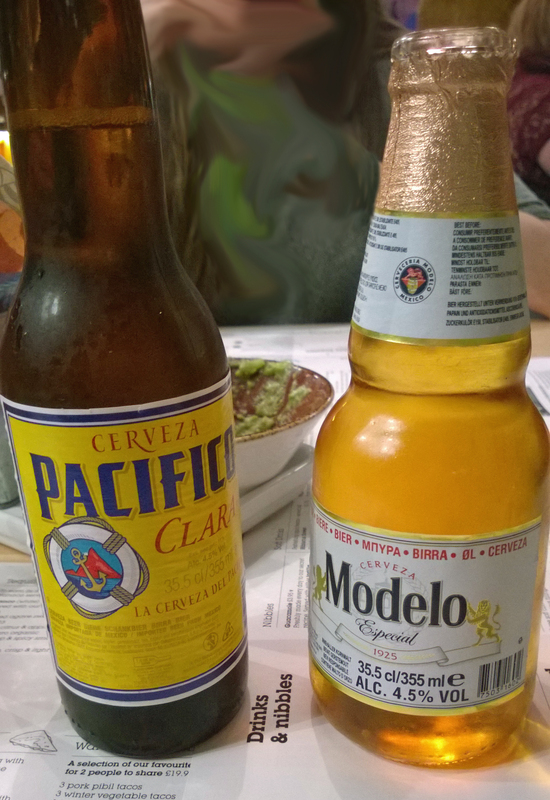 We had guacamole as a starter between three of us – probably two portions would have been too much but for three was not quite enough – but you need something to eat with the beer while you wait for the main event. For us this was two platos Fuertes – a British steak the Mexican way and Fish tacos, which we ordered with two sides, sweet potato and frijoles. 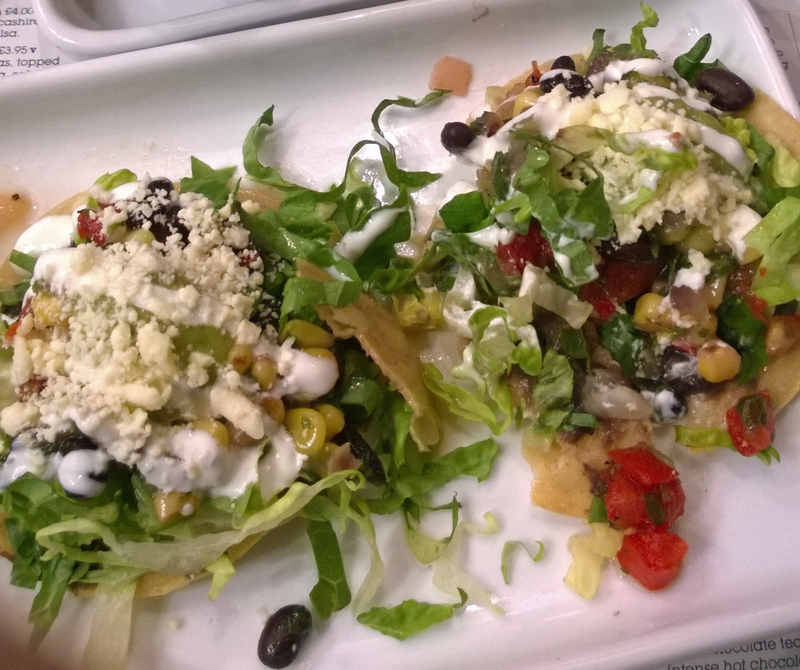 We also had street food – black bean tostada and winter vegetable taco. The steak was cooked as requested, medium rare, and was spicy and occasionally made my nose run but then I am sensitive. It came with a long red chilli but since sucking a scotch bonnet pepper at another restaurant in the market I decided to steer clear. 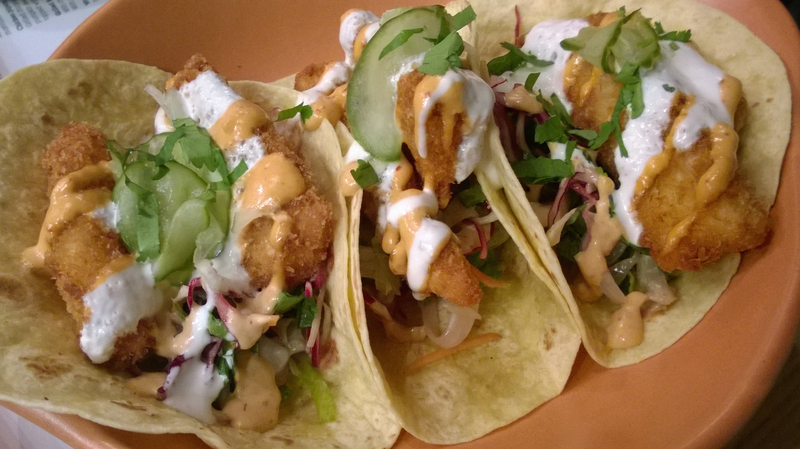 The fish tacos were a real success and we liked the two street food dishes too with the black bean tostada preferred for its flavour. Now we come to the sides and usually we do not make much comment…but the frijoles were the best we have ever tasted. Gone was the graininess of refried beans. They were smooth and tasty, and with a subtle flavour. The other side, sweet potato, was hot and crisp but soft inside – we loved them too. We washed these down with beer and a soft drink. 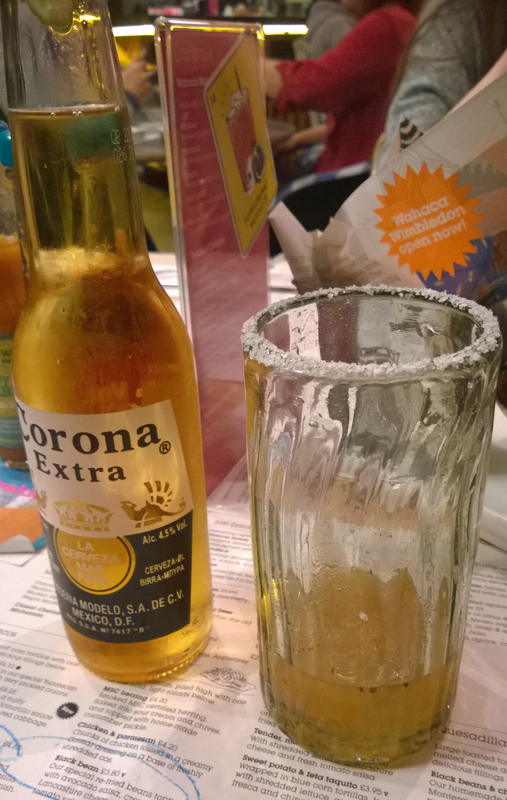 One of the party decided to try to Michelada which is beer with a lot of hot and sour flavours – chilli, lemon, pepper and salt rather like a Bloody Mary with beer instead of vodka. It was interesting but not a total success, unlike the other beers. The percentage alcohol accompanies each beer so you didn’t wander unheeded into the 5.4% versions. This was a successful visit and we will be repeating the experience. The staff were helpful and the service reasonably fast despite the number of customers, although we do advise a starter just in case. We certainly didn’t have room for any of puddings on this occasion. This is not cheap food like McDonald’s. It is good quality and we thought that dinner for three, including the alcohol, for £50.85 was fair value.